These adapter boards / breakout boards are DIP component holders which greatly simplify and streamline the wiring process. 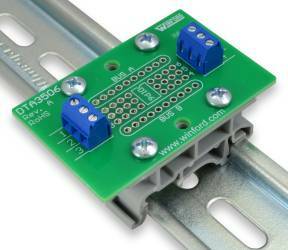 Once a component is installed in the adapter board, simply connect to each component pin via the corresponding screw terminal. The best way to install DIP devices is to simply solder them into the provided solder pads on the adapter board. Please note that these adapter boards boards are manufactured with a connection between each DIP pin solder pad and the corresponding screw terminal; no soldering of any type is necessary beyond soldering the DIP device into the board. The remaining solder pads for each component pin simply provide an area for making optional connections to headers or other components. In addition, two additional busses of solder pads ('Bus A' and 'Bus B') are provided for convenient distribution of signals such as power and ground. Adapter boards for several of the common DIP package pin counts are available. The solder pads on the board accommodate 0.3" and 0.6" footprint DIP packages. Extra solder pads for each DIP pin are provided on the board to allow the addition of small components such as diodes, capacitors, resistors, etc. Buses: Two groups of extra solder pads form buses for power distribution, etc. Bus A is located at the top of the board, and Bus B is at the bottom of the board. Screw Terminals: Each DIP pin is accessible via a clearly numbered screw terminal. This makes wiring quick and easy.